Time does fly fast. It exactly 25 years since I finished my engineering at SJCE, Mysore. 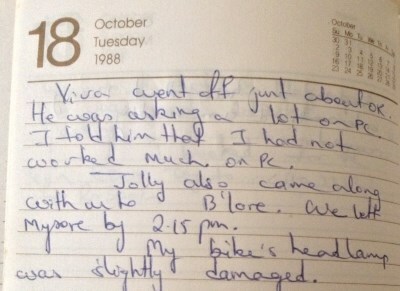 On Oct 18, 1988 I had my last exam. It was an exciting time for me because we were only the 3rd batch of Computer Science. Was wondering what was in store for me next. I vividly remember it was a viva exam. Not my favourite for sure as the examiner tends to demonstrate he is superior to the student and would take immense pleasure in grinding and humiliating us. But then all teachers were of not that type. I and my roommate were from Bangalore. We had packed the previous night, shifted our luggage and motorbikes (Hero Honda and TVS Suzuki) to the DCM Toyota I had booked. I seem to have documented the vehicle number and the cost! A mere Rs 300. Three of us, Shekhar, Ravi and myself had worked on our thesis project. The topic was “Natural Language Processing” under the guidance of Prof Chidananda Gowda. Dr. Gowda was not only well known for his work in artificial intelligence but also because he was the son-in-law of the famous literary personality Kuvempu. Without any hesitation, I can say Dr. Gowda was the most simple man on our campus. Rarely saw him get angry. My class was strong in UNIX, not on Windows. Our computer lab was the only one in India which was open 24×7, 365 days a year. All 3 of us made full use of the lab during night times after dinner, the big advantage of staying on campus hostel. Till today I am very comfortable with Unix OS and I give full credit to my college and hostel days for that valuable skill. Suddenly there was a sense of hollowness. We finished our exam, went to our hostel room and there was hardly anyone around the hostel. People had already vacated the rooms. Not a nice feeling at all. There was no celebration after the exam, each one was in a hurry to get back home. Reasonably sure it isn’t that way anymore. There is a slope going down the campus to the gate. As the truck started moving my roommate & classmate Ravi said “Goodbye SJCE, not sure when I will see you again”. I can never forget his words. There was a sinking feeling when he said that. From mechanical branch Kotresh Jolly (have lost touch with him) bummed a free trip in our truck. One has to go via Mandya from Mysore to Bangalore. My classmate, Rajesh MV was from Mandya and was nicknamed “Mandya”. He had finished his exam few days before us and had returned home. There was no concept of mobile phones in 1988. We told him approximately at what time we would be leaving Mysore on Oct 18 and lo, he was waiting for us on the highway. Just a quick hi, bye and we continued our journey to Bangalore. Dropped off Ravi and continued to my house. Unloaded my 2 trunks and bike and a new uncertain world was waiting for me. Without hesitation, I say 4 years of my hostel life taught me a lot which no school could have. I am still in touch with as many classmates I can reach out to. Few insist on meeting me when they are in India and I make it a point to meet them. Every meeting is a “repetition” of jokes from engineering days, we never seem to get tired of them. I urge the college to reach out to the alumni to give short lectures to students. They need a lot of guidance before they enter this competitive professional world. Bizcomp.in: What should be expected out of a business plan competition? Whoa! Have I forgotten my engineering Math? Thanks. Bought back lot of memories. . cycle stand, canteen, remember the model plane.. I do have the picture taken with you/Ravi and Shekar. Will email you later. 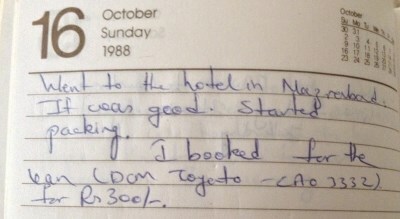 Really nice to read your ‘GOODBYE to the hostel’. Without doubt, everyone, who has ever stayed in the hostel. would reminisce about their final day and the Goodbye to the hostel. It takes a while for the feeling to actually sink in, the feeling of loss which would never get filled. Without doubt, our years in the hostel have contributed to our growth like no other thing in our entire life. An experience I would recommend to everybody. Nice read. Brought back fond memories.